Ammonium borate, most often used as a compound called ammonium pentaborate, is a chemical substance that has a variety of household and industry uses. The chemical most commonly occurs as a white powder that is added to detergents, glazes and cosmetics. It is fire retardant and is often used to buffer cleaning solutions. The most common use of ammonium borate is as a detergent booster. The most common use for ammonium borate and pentaborate is as a household detergent. As it is a strong abrasive and anti-fungal while being flame retardant and causing little irritation to skin or eyes, it makes for a strong and safe cleaning solution. 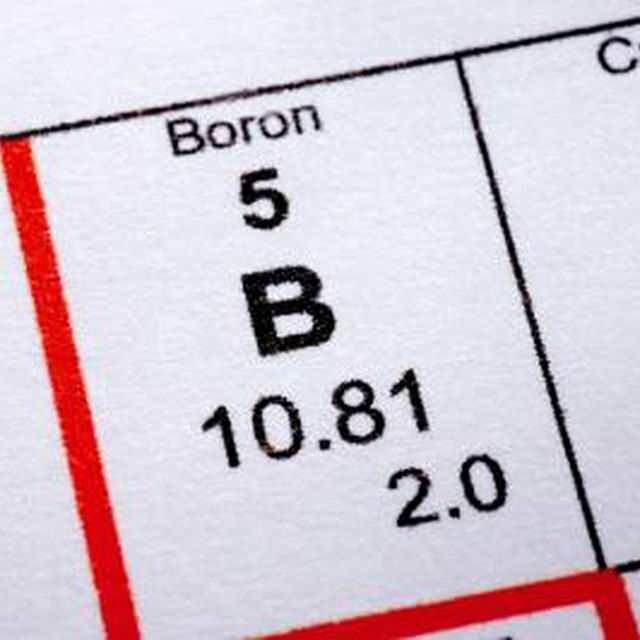 Borax, a common detergent, uses ammonium borate to boost the detergent powers of the mineral sodium borate. This powder, dissolved in water, helps to clean, disinfect, remove odors and even soften the water. Borax is most commonly used to clean clothing, though its disinfectant properties can be utilized to clean kitchen and bathroom surfaces as well. The same powdered solution of sodium and ammonium borate crystals can be used as an insect repellent. Borax works on both ant and cockroach infestations in the home. Borax mixed with a sugar solution and placed in areas common to ant or cockroach infestation attracts the insects to the poison, and then damages the digestive system of the pests upon ingestion. This damage causes the imminent death of the insects. Borax powder can also, however, cause damage and illness to household pets, so people with animals should avoid leaving large quantities of sugar and borax within reach of pets. Ammonium borate and sodium borate are also used as a ceramic glaze for potters. Borax itself can also be used as a glaze booster, increasing the shine and effectiveness of manufactured glazes when added in small amounts. Since borax is water soluble, however, it can occasionally be too thin when added to glazes with large amounts of water. Gerstley Borate is another ammonium borate containing glaze that is not water soluble, making for a more even application. Though ammonium borate and ammonium pentaborate has a low toxicity for humans, it is necessary to take the proper precautions for yourself, your pets and the environment when using products that contain this chemical. Exposure to large amounts of ammonium borate, specifically when inhaled or ingested, can cause nausea, vomiting and diarrhea. Excessive skin contact with ammonium borate can cause redness and pealing at the site of exposure. Small amounts of excess ammonium borate can usually be disposed of at landfills, though exposure of water sources to this chemical can cause ecological damage to fish and wildlife.